Mayor Hall called the meeting to order at 7:00pm. All Councilmembers were present. The Mayor proclaimed February as Black History Month. The presentation was given to Darnesha Weary, Director of the North Side Step Dance Team, and team members Mikayla Weary, Mikayla Sullivan, Cedella Dean, Melanie O’Brien and Kieara Johnson. Wednesday, Jan 30, Sound Transit is offering a drop in session from 1pm to 8pm to discuss project refinements to the 145th Corridor BRT. Topics include parking, station locations and traffic lane configurations. It will be held at the Shoreline Unitarian Universalist Church 14724 1st Ave NE. There will be another session in Kenmore the following day, and an online version will be available at the Sound Transit website. The Edwin Pratt Art Opening Reception was attended by over 100 guests. The exhibition will be open to the public from Jan 26 through April 26, 2019 during normal business hours on the third floor of City Hall. Public Reminder: The Parks Funding Advisory Committee meeting is Wednesday, Jan 30 at 7PM in Room 303. Councilmember Chang attended her first meeting of the King County Regional Transit Committee. This was also the first time Shoreline has been part of this Committee. They reviewed their 2019 work plan. Very little is slated to happen in the north end, so a meeting is scheduled with Chang and others to see how changes at Northgate will affect the service in our area. Councilmember McGlashan attended the Sound Transit Board meeting. The staff was updating the Board on the Lynnwood Link. Utility work is starting, tree removal, an access road along the freeway for the pillars installation, and freeway noise wall demolition and replacement with temporary walling. There will be a Shoreline community meeting with updates on February 26. Location to be determined. Councilmember Scully provided an update on the All Home Advisory Board. It is in the middle of a governance review of homeless outreach towards a regional approach and a central authority to eliminate some of the duplication of services. Elected officials on the Board, such as Scully, will be removed from the board. He feels this is probably a change for the good. Councilmember McConnell stated there are several activities this weekend for anyone interested in one more look at the Seattle viaduct and/or the new tunnel. Mayor Hall said the Council had a dinner meeting tonight with the Parks Funding Advisory Board..
Jon Ann Cruver asks that seniors be involved in the Community and Senior Center planning. Come to us, listen to us, and learn from us, and include us in decision making. The senior population is growing in Shoreline. Recreation, support services, social interaction, volunteer opportunity, and a hot lunch are just some of the activities available. We are Kupuna, a Hawaiian word for grandparent that has much more meaning. Kupuna are those we come from, the ones who have lived before us, and the ones we live for today. John James spoke in favor of the Senior Center having space in the new Community Center. He has been a corporate sponsor of the senior center over the last several years, and he has been involved in activities honoring and video recording veterans of WWII whose stories might have been lost forever. Theresa LaCroix requested the new Community Center include a commercial kitchen and a dedicated 6,000 sf space for the Shoreline/LFP Senior Center. In February the Council will be reviewing the Shoreline Aging Well Strategy. This Strategy has five major focal points: nutrition, lifelong learning, wellness, coordinated service alignment (volunteerism), and community connection. Gloria Kawabori said she took several years to admit that she is a “senior citizen.” And she thought she would never join a senior center - but to her surprise, there are so many classes available that she joined several. She added, it is said that the manner in which a community regards and treats its elders reflects the soul and the heart of that community. Kathleen Randall says, with all of the construction in Shoreline, it would be a good time to consider underground utilities. Agenda and Consent Calendar approved unanimously. Action 8(a) Interviewing City Council Applicants for City Council Position #6. The candidates were interviewed separately so other candidates could not hear the questions/answers. This prevented any benefit in the order the individuals were interviewed. The Council met at a table with the candidates, rather than remain on the dais. Each candidate was asked seven questions and given about 15 minutes of interview time. The candidate could make a brief comment at the end, if time permits. 1. Please share with us why you are interested serving on the City Council and how your experience and skills would make you the best-qualified candidate. 2. Often the City Council must adopt policies to address competing goals. One area that can be challenging is goals to protect the environment and goals to protect an individual’s right to use their property as they would like. How would you balance the goals of protecting the environment and allowing people to use their property? 3. In addition to Council meetings, Councilmembers generally serve on regional committees, attend City community events, and meet with community groups, residences and businesses. How will you balance the time required to serve on Council with other responsibilities, interests and activities that you may have? 4. Can you tell us about a time when you were on a team and you did not like the direction the team was going? What was your response and what did you learn? 5. Please share with us how you have familiarized yourself with the issues that the City Council will be required to address in the next few months, and what are the two primary issues that you believe will be most important for the Council to address. These issues can be from those on the current work plan, Council goals, or any issues you think need to be added. 6. As Shoreline is increasing in diversity, what will you do to be inclusive of our entire population, especially encouraging residents who may not have previously participated in the City’s boards, committees or neighborhood associations? 7. The final question is: If appointed, do you plan to run for election in the fall? Do you have any comments you would like to add? Council interviewed Jennifer Greenlee, David Chen, Eben Pobee, Betsy Robertson and Genevieve Arredondo. Rebecca Rivera withdrew her candidacy prior to the Council meeting. The Mayor and Councilmembers exited the Chamber to evaluate the candidates. The Mayor announced the meeting was back in session. Betsy Robertson was appointed to fill Council Position No. 6. Councilmembers and the Mayor individually expressed the difficulty in making the selection from the group of qualified candidates, stated their appreciation and thanks, and encouraged them to look at other opportunities within the City where they could be a valuable asset. 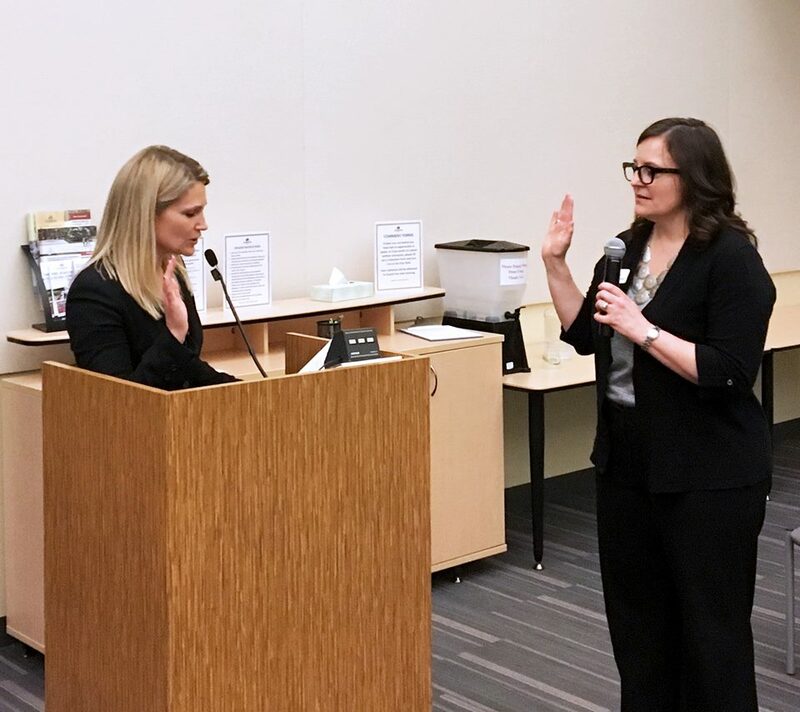 The Oath of Office was administered to Betsy Robertson by Jessica Simulcik Smith, Shoreline’s City Clerk. Action Item 8(d). Electing a Deputy Mayor. Councilmembers McConnell and Scully were nominated. McConnell was voted Deputy Mayor by a majority vote of 4. The meeting was adjourned at 10:05pm.